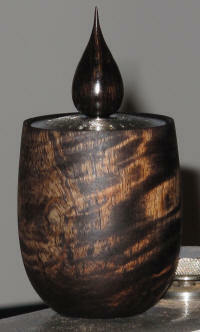 Simon’s main project for the evening was a hollow form with a pewter lid and a black wood finial. He started by mounting a block of mango with fiddle back grain, measuring 2” square by 4”, between centres, using a steb centre. 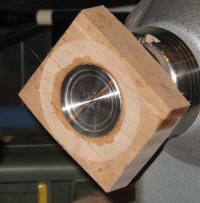 He roughed it down to a cylinder then turned a dovetail spigot with a parting tool and mounted it in the chuck. He used a bowl gouge to trim the outside down and start to shape the outside, leaving it thick at the headstock end to give it strength. He turned a gentle curve, making sure there were no flat spots. (See photo SH_01). He used a milling cutter (bull nose slot drill) to drill down the inside and start hollowing it; it was quite an aggressive cut but he went more carefully towards the end, to refine the cut. Simon then went on to demonstrate two different tools for hollowing – a negative rake scraper and a Robert Sorby ‘pear drop’ scraper – he says the Sorby tool gives a slightly better finish although both tools cut fairly easily. To sand the inside he used a home made tool which has a cone shaped end with ‘hook and loop’ sandpaper attached to it. To finish the inside he cut a lip inside for the lid to fit onto then cut a slight angle on the front edge. (See photos SH02, 03 & 04). Simon used a swept back bowl gouge to finish the shape of the outside and turn the underneath, then he sanded the outside with 180 grit. To finish it he applied black stain with a brush to both the inside and outside of the pot then set light to it to burn off the spirit from the stain and dry it quickly. Fortunately this did not set off the fire alarms! He then continued sanding through the grades to 600 grit which gave a mottled, marble effect. Using a parting tool he cut most of the way through the bottom then finished the cut with a saw to leave a pimple at the bottom to use when reverse chucking it later. (See photos SH_05 & 06). Next Simon turned his attention to the pewter lid. First he turned a mould for the lid - he mounted a scrap block of maple between centres to turn a spigot then mounted this in the chuck and tidied the surface. He marked the size of the top of the pot onto this, making it slightly oversize and used a swept back spindle gouge to turn a fairly shallow recess. Then he melted some jewellery grade pewter in a pan on a gas stove, taking care not to overheat it, explaining that you should use it as cool as possible - when it is just melted. He poured this into the mould, making it oversized as you cannot add to it. (See photos SH_07, 08, 09 & 10). After a 20 minute break the pewter was still slightly warm, but it had set enough for Simon to start using it. He ran some thin superglue round the edge of the pewter in the mould so it would stay in place when he turned it, then sprayed it with activator to set the glue and cold water to cool it down. Once it was cool enough to turn he dried it off and mounted it in the chuck. Using a swept back spindle gouge turned on its edge he skimmed the surface, taking off a dull layer and revealing a lovely shiny piece of pewter. He used Vernier calipers to mark out a recess to fit on the chuck then turned away the material from the centre, leaving a slight dovetail to fit onto the chuck. He mounted an 8½mm drill in a jacobs chuck in the tailstock and drilled a hole through the middle of the pewter, to take the finial. After checking that the recess fitted the chuck he brought up the tailstock to hold it in place and used a thin parting tool to cut the timber round the pewter to release it from the mould. (See photos SH11 & 12). Next he mounted the pewter onto the chuck and, with the lathe running at 1600 rpm as you don’t want too much friction when turning pewter, he used a swept back spindle gouge to clean the surface and turn it to shape. He measured the inside of the pot with Vernier calipers, transferred this to the pewter and turned it to size with a parting tool, going for a slightly loose fit. Using a ⅜” swept back spindle gouge he made a chatter pattern on the surface, pushing the tool hard into the surface towards the middle and drawing it out towards the edge, but stopping short of the edge so the outer edge would be smooth. To finish it he went over it with 0000 grade wire wool to remove any burrs. He explained that when pewter goes black, as it inevitably will, you can use T-Cut, pewter polish or silver polish to bring back the shine. (See photos SH_13, 14, 15 & 16). Safety Note When turning pewter the shavings come off in long streamers which can quickly wrap themselves around your work or tool, so it is important to ensure all the shavings are pushed to the floor and not allowed to rest on the lathe or in the area where you are working. When you have finished, the pewter savings can be gathered up for re-melting to use again. For the finial Simon mounted a 1” square piece of black wood into the chuck and turned it into a simple tear drop shape, with a spigot to fit into the hole he had drilled in the pewter. He sanded it down to 600 grit then burnished it with 0000 grade wire wool. He parted it off and glued it into the pewter lid with superglue, although he says he normally uses epoxy resin. (See photo SH_17). 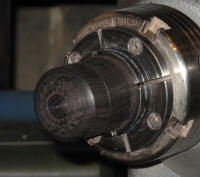 To finish the pot he mounted it on a jam chuck, using the tailstock to centre it, then he turned the underneath flat, cutting through the last bit with a saw. He treated the pot and the pewter lid with Danish oil, applied with a paint brush and wiped off with paper. (See photos SH_18, 19, 20 & 21). 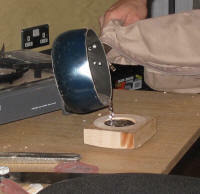 For his second project Simon made a small box with a screw threaded lid to demonstrate how he does thread chasing. He mounted a piece of black wood in the jaws and turned it to a cylinder approximately 1½”-2” diameter then turned a small dovetail spigot on the end. He parted off a piece approximately an inch long to make the lid then turned a spigot on the wood left in the chuck and remounted this piece in the chuck, using the spigot he had just made. He used a spindle gouge to turn away the inside then made sure the inside edges were straight and the top was level. He turned a lead in chamfer on the inside edge and used a hook to make a recess to turn the thread to. To chase the thread he ran the lathe at 400 rpm then forced the tool to start the cut at the chamfer, until it got to the stage where the thread pulled the tool through. When he was happy the thread was straight he took it off the lathe and mounted the other piece of timber using the spigot he made earlier. He turned away the timber he didn’t want then turned a spigot approximately 1½mm bigger than the thread he had cut on the bottom of the box and cut a groove at the back of it. With the tool rest at centre height he forced the tool to start the thread then let it flow. He kept checking against the inner thread on the bottom of the box until it fitted and was slightly loose. He used wax to lubricate it and help it cut more easily. Once the lid fitted correctly he screwed it on, tidied up the edge and turned the outside of the lid. He sheer scraped the top and used the spindle gouge with an aggressive cut to put a chatter pattern on it which he then framed with a fine cut each side of it. He finished turning the inside of the box with a spindle gouge, taking care not to open up the cut too much then parted it off. To finish the underneath of the box he put a scrap piece of wood in the jaws, tidied the face up and cut a recess, slightly bigger than the diameter of the box all the way through it. He pushed the box into this recess then tightened the jaws to grip it and tidied up the bottom of the box. (See photos SH_22, 23, 24, 25 & 26). I have never seen Simon turn before so this was a new experience for me. I found both projects very interesting, especially when he turned the pewter as I hadn’t realised that was possible. It was also interesting to see someone else’s take on thread chasing as I have only ever seen John Berkeley do it before.